We have had some exotic birthday locations this past year. 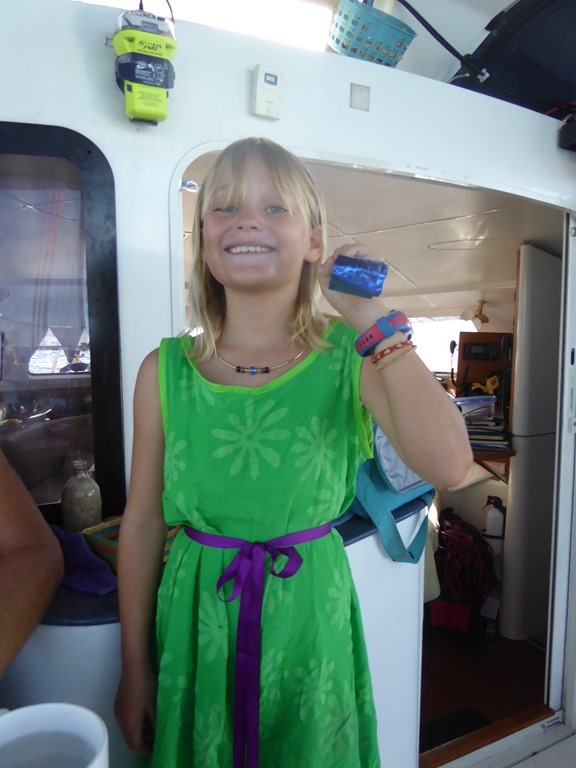 Lou’s was on passage between Barbuda and Sint Maarten. 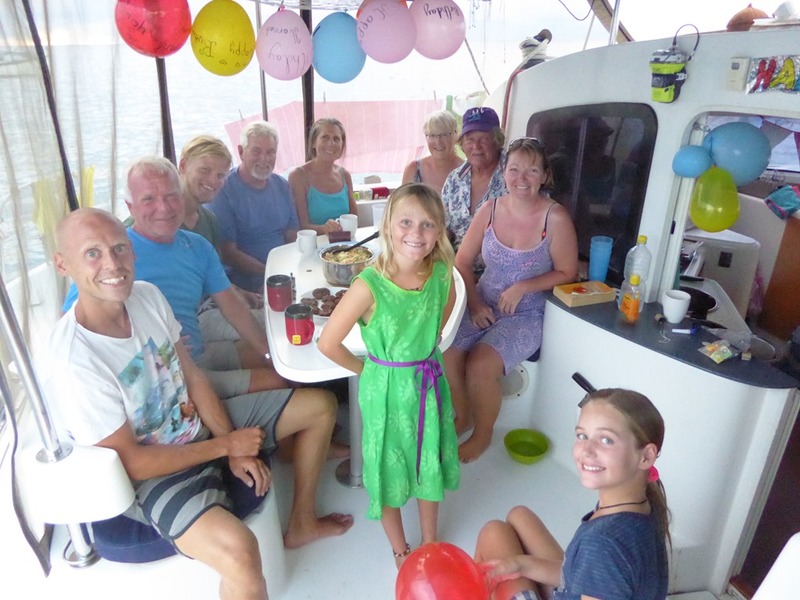 Eleanor’s was celebrated on passage half way along the S side of Haiti heading for Cuba. Mine was at the S end of Makemo. 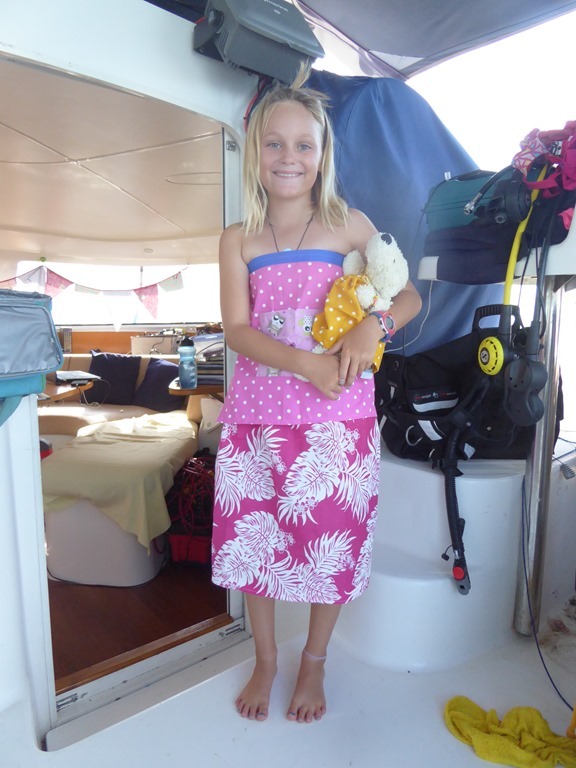 Hannah, living up to the requirement for another memorable place was held at the S pass of Fakarava. Someone had to be sent back to bed at 0500hrs as they were a little overexcited. However, at a still early but reasonably civilised time, presents were opened on board. 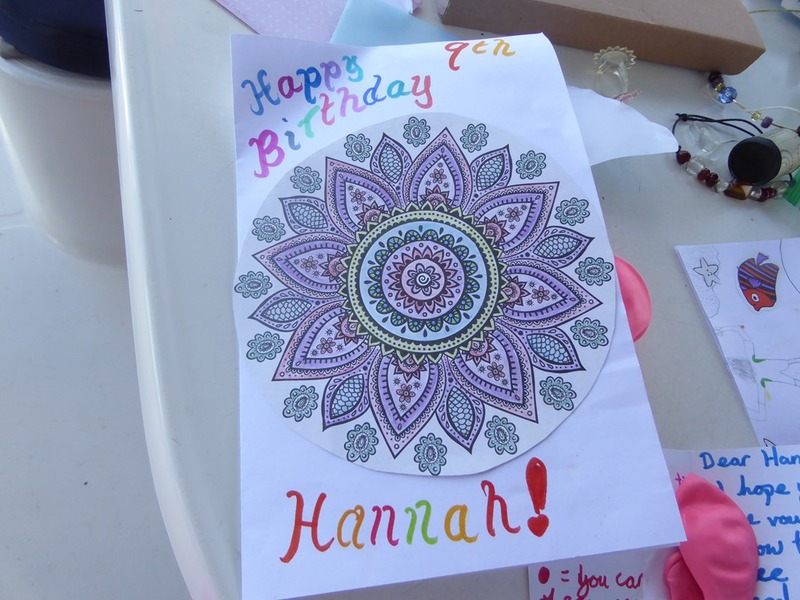 Hannah did particularly well out of Eleanor’s burgeoning craft skills. The gift cards promising to give unargued choice of films for film night and free bed making went down as well as the skirts (for Hannah and Snowy), cooking apron and a variety of necklaces and bracelets. A great addition to the gift pile was a bag of balloons from Julia and John and the girls had a lovely time decorating them with pictures and birthday messages, putting them up around Skylark. Party blowers provided plenty of noise. 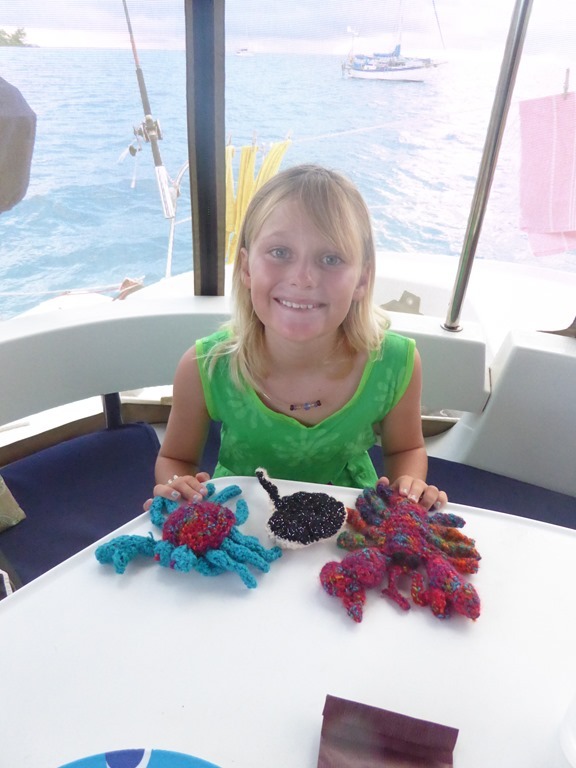 Julia had also produced a beautifully crocheted crab (dutifully named Cedric) to add to the crocheted sea life collection that Julia had worked on during a productive crafty afternoon. There was a special breakfast of pancakes. 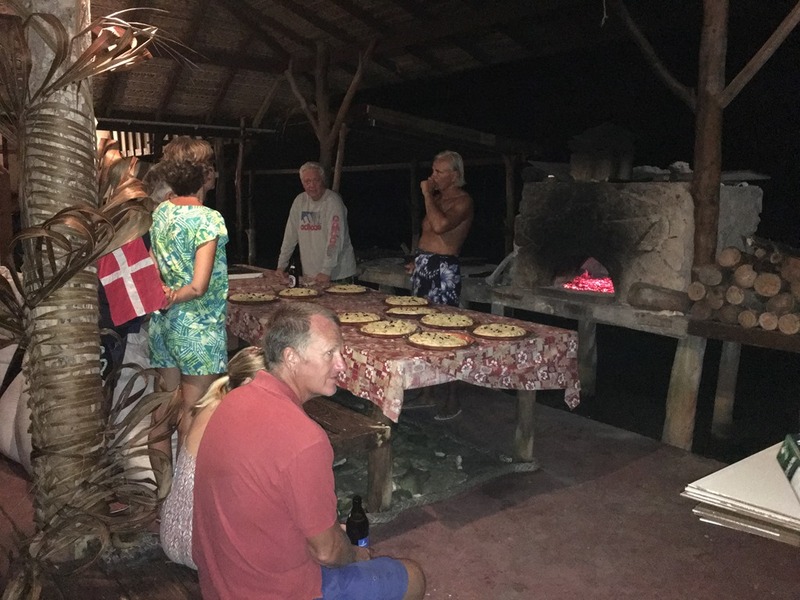 Unfortunately our last kilo of flour, bought and held back for the task in Rotoava before we came S, turned out to be inhabited by a few too many weevils for Lou’s liking! The day was saved by Mary Ann II and Taranga who both managed to supply some flour which did the job for both the pancakes and then a birthday cake, ably iced by a somewhat sticky Eleanor. Our thanks to both yachts. We had a lovely snorkel through the pass, roared through by a strong current and then a little play on Skylark. The afternoon brought Taranga, Mary Ann II and our neighbours, Ocean Star on board for a birthday tea and cake. The food collection was impressive with cookies, cake, biscuits and a huge pot of macaroni cheese from Mary Ann II, which all went down extremely well. We even got everyone, a la Officers’ Mess traditions, to sign in the Visitors book. Good memories! We had to wait for a day to have a birthday dinner at Manihi’s as he was full of guests on Hannah’s birthday. However, the homemade baked pizza were worth waiting for, the company was great and our thanks to Manihi for the pineapple cake covered with icing and decorated with flowers. 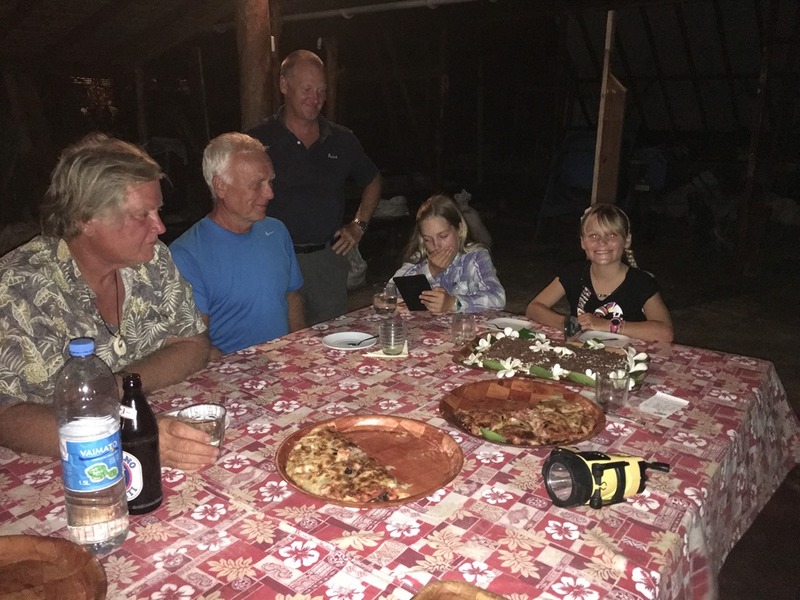 The Taranga crowd sang a Danish birthday song – Hannah was a little suspicious about what they were actually saying – which was again greatly appreciated. Hannah came home happy and exhausted. Our next birthday to celebrate is Lou’s which will be in New Zealand. We had better get planning but I’m already thinking Yorkshire puds, fresh veg and gravy need to figure……..
Love the pictures of Hannah on her birthday. You guys all look amazing. The nights are drawing in here and it’s beginning to feel wintery – the kids took scarves and gloves to school for the first time today. I am sitting in the Starbucks at our local Sainsbury, full of cold and feeling a bit sorry for myself. Reading your blog has cheered me up no end. Take care lovely family Henderson! !